Kerry A. Benninghoff believes government should improve the lives of those it serves, recognizing that every dollar government spends was taken from someone who worked hard to earn it. 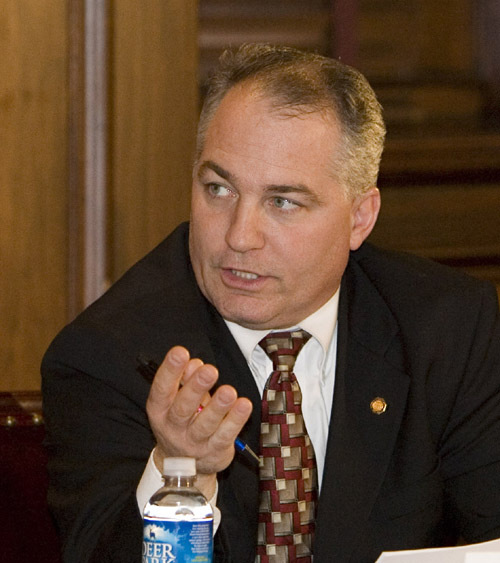 Representing the 171st legislative district, Kerry is passionate about cancer research and other healthcare initiatives, ensuring an educational system that gives our children a clear path to good-paying careers, being a voice for victims of crime, as well as standing up for seniors while building a better future for the Commonwealth of Pennsylvania. Kerry believes taxes should be low and works hard to ensure your dollars are spent wisely. He is a watchdog for government waste, a longtime advocate for greater transparency and supporter of government reform. Kerry was elected by his colleagues in November 2018 to serve as Majority Whip. As the Majority Whip, he is responsible for tracking House votes, aiding the Majority Leader in advancing the Caucus agenda, and informing his Republican colleagues on upcoming issues and important pieces of legislation. Prior to serving as Majority Whip, Kerry served on the Leadership team for two terms as the House Majority Policy Committee chairman. In this role, he led legislative hearings in every corner of the state, building a strong case for important policy issues like tax reform, regulatory reform, welfare reform, job training and career readiness, opioid addiction and economic development. Kerry also previously served as chairman of the House Majority Finance and State Government committees. He is the founder and current chairman of the bipartisan Cancer Caucus. Prior to being elected to represent the 171st, Kerry worked in construction, cared for patients as a hospital orderly and served Centre County for two terms as county coroner. Kerry is a charter member of Leadership Centre County and formerly served on the board of directors of Easter Seals of Central Pennsylvania and the Bellefonte YMCA. He is a member of the Bellefonte Kiwanis Club, the Fraternal Order of Police, Bald Eagle Lodge No. 51, as well as an active member of Faith United Methodist Church in Bellefonte. He serves on the board of directors of Centre Home Care Inc. and also formerly served as co-chairman of the bicameral Penn State Forum on Higher Education. Kerry is a graduate of State College Area High School and attended Pennsylvania State University. He is a graduate of the Certified Coroners Training Program conducted in Hershey by the state of Pennsylvania. Kerry resides in Bellefonte and is the father of five children – Michael, Heather, Amy, Kelley and Ryleigh. At the end of 2010, Ryleigh succumbed to cancer. The 171st District includes portions of Centre and Mifflin counties. Kerry was first elected to the House of Representatives to represent the 171st District in 1996.